The Arctic is a mineral-rich area and important strategic zone, particularly as melting ice makes the region more accessible. While many nations, including Finland, Norway, Canada and Sweden, have civilian research facilities dotted across the Arctic, the US and Russia maintain the strongest military presence by far. China has recently begun establishing its own Arctic presence. 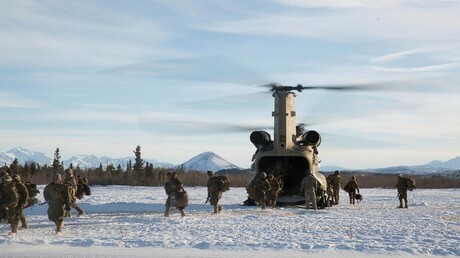 From March 12-16 the US military launched Arctic Edge 2018 in Alaska, the first exercise of its kind in over three decades. Troops from roughly 20 units trained in extreme cold-weather conditions, to simulate Arctic environments. The Arctic Edge task force includes members of the Air Force, Army, Coast Guard, Marine Corps, and Navy. The forces try out new equipment and practice long-range ground and air maneuvers, including air drops, reconnaissance and direct-action operations. The operation largely took place in the Joint Pacific Alaska Range Complex and Long-Range Radar System sites in Alaska. The exercise spanned 1.5 million acres, 65,000 square miles of air space and 42,000 square nautical miles. Russia’s navy and air force regularly conduct drills in the Arctic Circle to maintain readiness. In 2017, Russia conducted the largest military exercises in the Arctic since the fall of the Soviet Union 1991. The expansion and refurbishment of air and radar bases on northern Arctic islands affords Moscow tactical superiority in a region which covers almost half a million square miles of the Arctic, reports Reuters. “We won’t threaten anybody, but, using our advantages, of a territorial nature in this case, we will ensure the security of Russia and its citizens. In this sense, the Arctic region is extremely important for Russia,” President Vladimir Putin said of the Arctic in the documentary film which bears his name. Russia is the only nation in the world capable of deploying an entire fleet of nuclear icebreakers, which may prove invaluable to rescue operations as time goes on and climate change continues to wreak havoc on the Arctic ice shelf. “Not a single [other] country in the world has a nuclear icebreaker fleet. The Soviet Union used to have it, Russia has it, and we have plans to develop a powerful new-generation icebreaker fleet,” Putin said. Russia has recently expanded and refurbished its military and research facilities within the Arctic region, including the Arctic Trifoil compound, the world’s only permanent structure at 80 degrees latitude above the Equator.